The Unified Portal Member who have registered their EPF Complaint Online using EPFiGMS Grievance portal can check their registered complaint status and setup reminder to EPFO using their EPF Online Complaint Registration Number of Grievance. 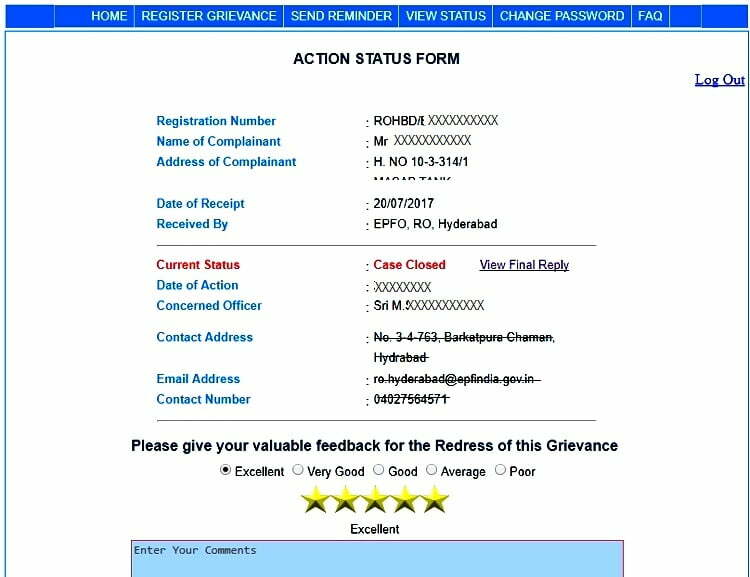 This is very good felicity to the EPF INDIA UAN holders to check their submitted EPFIGMS Grievance status online using reference ID number of complaint, and no need to wait to know about the status and current status of grievance, we have provided simple steps to check EPF Grievance Status online just follow. Enter the Security code, and proceed with submit option. After login with using the credentials you will seen your EPF Grievance status on the screen with current status of your EPF Complaint. Then Give tour rating rating also for EPF grievance status. The EPF India is provided the felicity for the members who have registered online complaint the candidate who have not solved their Grievance more then two weeks using registration number of EPF Online Complaint. According the information the EPF Grievance will be solved in 30 days of complaint load, and the reminder felicity is useful to re-intimate of complaint. Here is the simple process to use EPF Grievance Reminder facility. Now submit remind option to send reminder for your EPF India Online Complaint. EPF Passbook contains all transactions made by the employer and by the employee in EPF accounts with detailed contribution of every month statements will be provided, the passbook also contains any interest that has been deposited in the beneficiary’s account, and it will be accessed conveniently online by going to the EPFO portal. Many people confuse about EPF UAN passbook, actually both are same of all transactions to your EPF Balance statement. below we given step by step process to check through online. 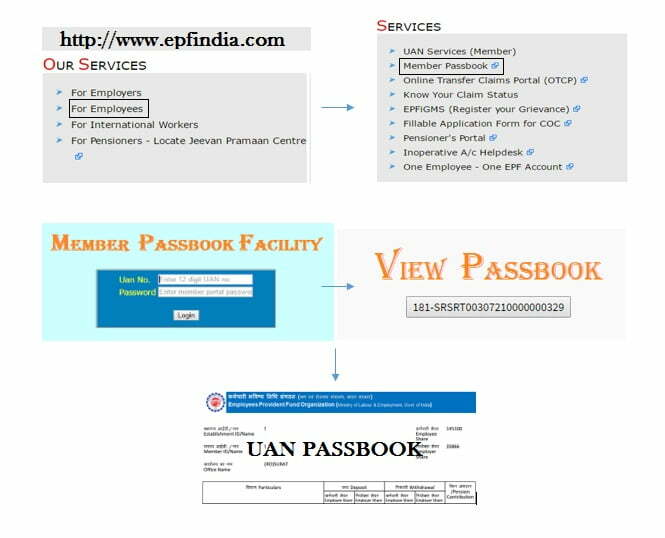 EPF UAN member passbook download is very simple as we explained in previous articles about UAN Login and UAN Activation, to download your UAN EPF e-passbook you need to visit www.epfindia.gov.in Web Portal. The e-passbook section on the EPFO website will be accessed by employees who are registered on the Unified Member Portal, below we given step by step process to check through online. Then click on FOR EMPLOYEES option under OUR SERVICES. You will find MEMBER PASSBOOK link in the SERVICES SECTION. 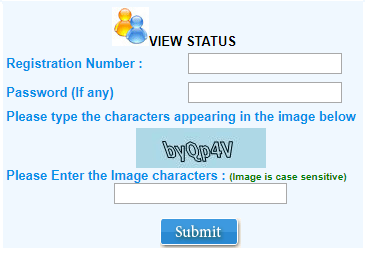 Then you will be redirected to a page asking enter use name, password, and captcha. Fill it with necessary details and click on login. Then member IDs of all EPF accounts linked with your UAN will be displayed on the screen. Click on the EPF Member ID under SELECT MEMBER ID TO VIEW PASSBOOK. 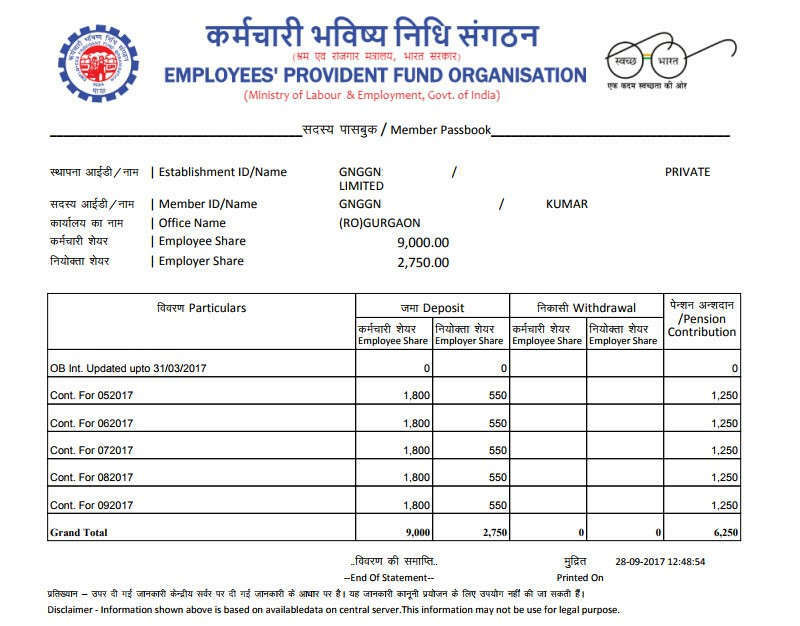 Then you will see your EPF UAN Passbook in PDF format,This passbook can be downloaded and printed directly as well. Dial and Give a Missed Call to 011-22901406 to get your EPF Account Balance Instantly by using EPF India Balance Check Phone Number….. The Employees’ Provident Fund Organisation of India has provided this service to the UAN holders to check their account balance and statement instantly with simple process by dialing a missed call to the EPF Balance Checking missed call number, and this is free service to all EPF India Account holders of registered users of Unified Member Portal. Every EPF India UAN Account holder can dial 011-22901406 by using your registered mobile phone to get instant statement report of EPF Balance by SMS service, this good service introduced by EPFO for all basic phone and smartphone users of EPFO, this service give instant account statement as per UAN of user. Presently all Nationalized Banks and other sector companies are provided the service to their account holders to checking their account balance by using messed call felicity, that’s the way the EPFO also started the service to check EPF Balance by Missed Call service and they have provided the unique phone number to dial to access the service. 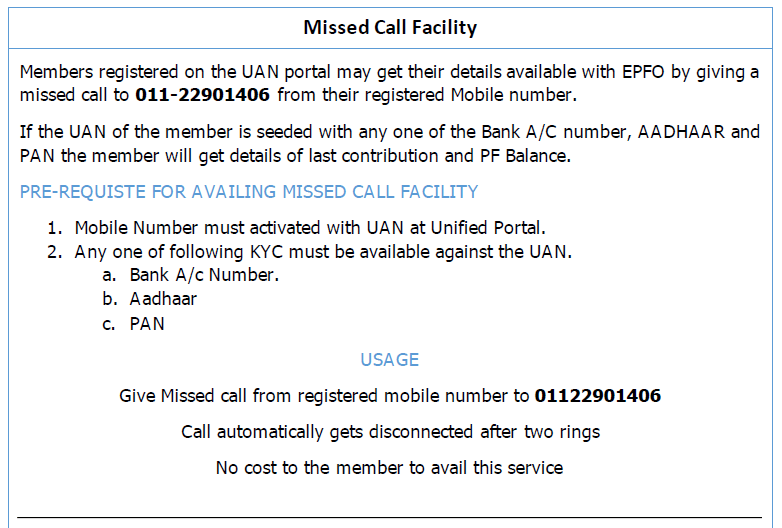 All the Active EPF UAN Users can follow the image to check official announcement of this EPF Balance Check Missed Call Number and download the official Notification Pdf issued by EPFO. 011-22901406, after that the call will be distinction with just two rings, now the EPFO will reply to this registered phone number with latest balance statement of UAN Account by SMS. The UAN holder must to seed with any one of the Bank A/C number, AADHAAR and PAN Card Details. The EPF UAN Account holder of Private organization, they cloud not access this service, they need to contact their office employer. 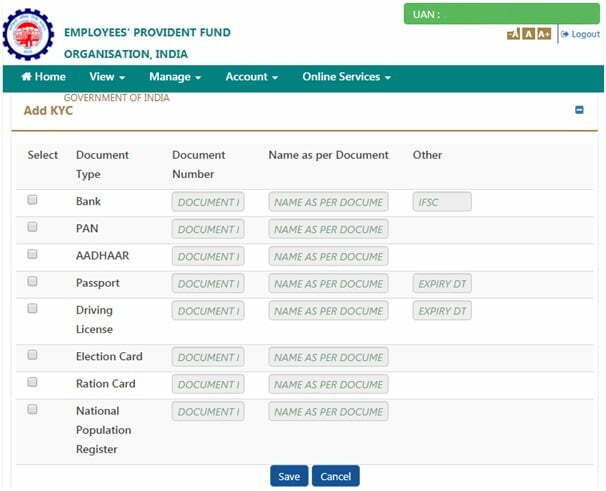 The Indian government announced that it is mandatory for the employees to link Aadhaar and other details with their EPF account, they named it as EPF KYC update, Employees’ Provident Fund Organisation of India has made easy for employers to update KYC details through online, so, you can update EPF KYC online at official portal of epfindia.gov.in. Actually KYC refers to know your customer. If you have approved KYC details in your UAN by employer then no need to depend on your employer, you can withdraw and you can apply for loan directly from EPF India Portal. EPF UAN KYC update details include Aadhaar card, PAN card, bank account details and etc, if you not updated KYC details on the EPFO portal at yet, you must have to update now through official portal. You can’t get updates from EPFO if you are not updated KYC details, there is no delay during EPF transfer and withdrawal of money only when if you updated details properly and claim may get rejected if bank details are not updated, you have an active UAN Number to login into your account. If you are not activated UAN, activate it now through unified portal or follow my previous articles about how to UAN Activation procedure, without active UAN Number you cant do anything, below we given step by step process for EPF KYC update for Aadhaar linking. First of all open given URL https://unifiedportal-mem.epfindia.gov.in/memberinterface/. Then login into UAN portal by providing valid UAN number followed by password. After successful login click on KYC option under MANAGE tab on top menu bar. Then KYC details updating form will open, fill it with necessary details. Tick on the box in front of the document that you want to update and once check the form correctly, then click on SAVE button. After clicking on SAVE option, your data will saved under the PENDING KYC section. you can cancel this process by clicking on the X sign marked right side of the page before it’s verification. details are verified by the EPFO, then verified sign will marked on the document.